A few weekends ago we flew to Morristown, NJ to attend the annual meeting of the Hypertrophic Cardiomyopathy Association. This is a patient advocacy group that hosts a meeting each year where patients can mix with the leading experts in the field who study HCM and other health care professionals who attend to get continuing education credits. The academic content is top notch, but the most interesting part is the relationships forged between the HCM patients. Information is exchanged, along with war stories of dealing with hospitals, insurance, employers, classmates, family, and the rest of humanity. 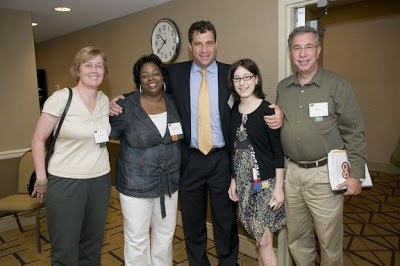 The picture shows us with Emily's all-time favorite doctor, Marty Maron and his assistant Murdena Mills. Way back at the beginning of this blog is a picture of Marty and Murdena visiting Emily in the ICU three days post-surgery, when her cheeks were puffy with steroids, her hair was greasy with unmentionables, and her eyes glassy from narcotics. What a difference a few months makes! Her biggest trauma this time was that the hotel threw her out of the bar for being underage. True to form, the President of the HCMA, Lisa Salberg, intervened on Emily's behalf. Lisa has forcedCongress to pass legislation to make genetic discrimination illegal, schools to install AED's (Automatic External Defibrillators), and insurance companies to support travel to Centers of Excellence that she forced hospitals to set up, so a rule in a hotel was no match for Lisa. Her greatest victory of course was to get Marty Maron to take Emily on as a patient just two years ago and see her on a Friday night after hours so that Emily got the care that saved her life. Consequently Emily got to hang out with the doctors and patients until they threw us all out of the bar because of the arrival of a bellicose wedding party. Our moment came when Emily participated on a "Patient's Panel" about heart transplants. In concise, clear, and straight-forward language she explained how she felt when she was diagnosed with HCM and had to get an ICD, and then how she felt when she was told she needed a heart transplant and had to deal with the waiting and then the surgery. She held her audience of 250 spellbound, and her parents were mighty proud. A rockstar as always. Em you always hold our attention.